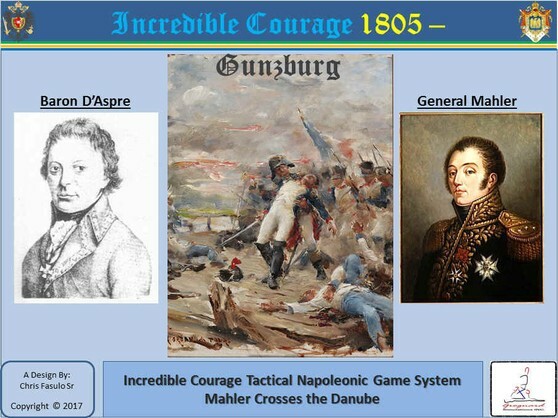 Incredible Courage - Grognard Simulations, Inc. There are 'Upgrade' packages for Austerlitz and Elchingen. 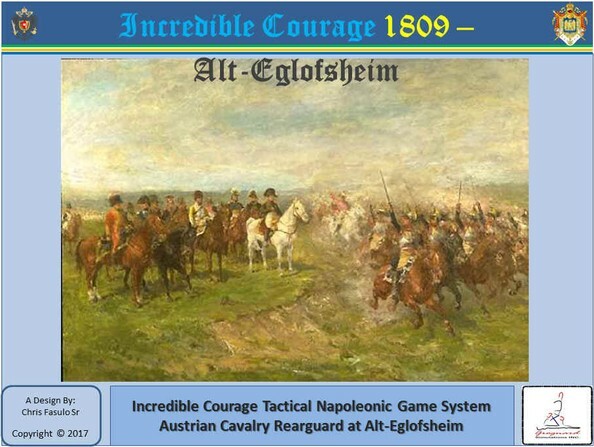 They bring both games up to the standard of the 100 Days games with Cavalry Regiment counters, Disordered markers, and a number of other improvements. These upgrades are not built into the games and, if desired, must be purchased separately. The games play great as is, the upgrade makes it a bit more user friendly. 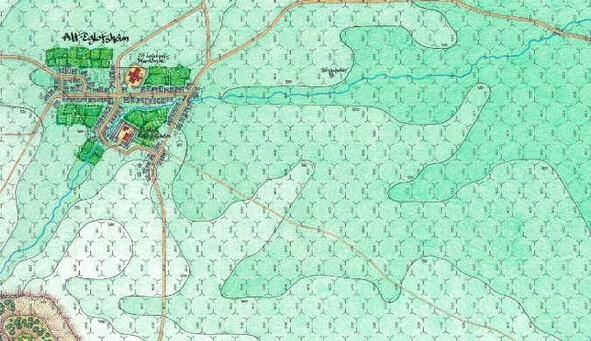 Austerlitz - Telnitz - The first and smallest game in the series. A great introduction to the system in the southern part of the battle where Marshall Davout made a name for himself and the III Corps. Austerlitz - Pratzen - The second game that moves to the central position on the Austerlitz battlefied. Marshall Soult leads the IV Corps to the top of the Pratzen Heights and fights off the Russian Imperial Guard. Austerlitz - Santon - The final installment to the Austerlitz battle where Marshall's Lannes and Murat beat General Bagrations' Advance Guard on the northern part of the field of battle. 100 Days - Quatre Bras - Marshall Ney is told to take the crossroads at Quatre Bras and send majpr portions of his command south and east to help Napoleon win the battle at Ligny. 100 Days - Ligny - The Emperor takes on the crusty Old Soldier Blucher and his improved Prussians and wins his final, but incomplete, victory. 100 Days - Wavre - Marshall Grouchy is told to pursue the defeated Prussians and keep them away from interfering with the battle at Waterloo. Needless to say, he fails miserably. 100 Days - Waterloo - The Emperor ends up badly outnumbered, but his French troops maintain their steadiness until the Imperial Guard is turned back during the last attack. Marshall Ney is told to cross to the northern bank of the Danube, during the Ulm campaign, and take the 2 towns on the other side. 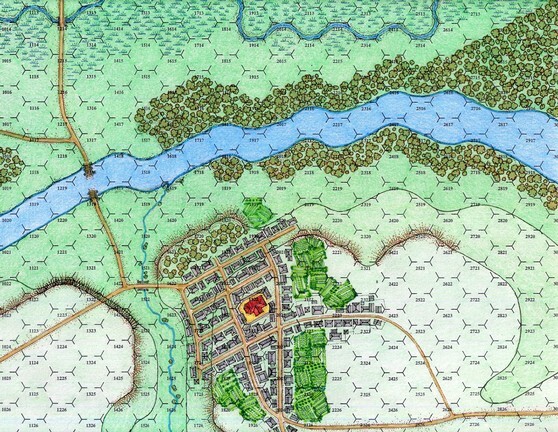 A sample part of the IC-Elchingen map. An updated and reformatted set of rules for the entire Incredible Courage system is available. Just ask or check CSW in the Incredible Courage header area. 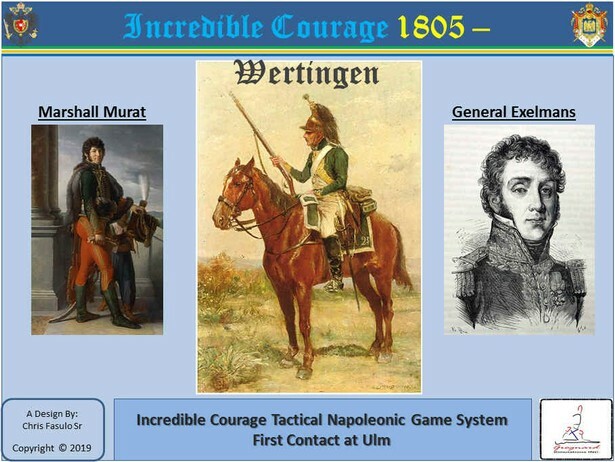 Incredible Courage at Elchingen (ICE) is a small introductory game that pits Marshall Ney against the Austrian General Reisch. The situation is that the Austrians occupy a strong position on the north side of the Danube River in a position to threaten Napoleon's line of supply and communications. Napoleon orders the Marshall to take his Corps across the river and defeat the Austrians. A river crossing operation is very complex and should be done with care and adequate time and preparation. Ney does not have this, but he has something better, an Austrian opponent that is comfortable sitting in place and awaiting the enemy to come to him. The Marshall takes advantage of this and makes short work of the Austrians. Try your hand at this action and see if you can also be deserving of the title "Duke of Elchingen"! The game features adjustable strengths (that help decide firepower and melee strength based on formations). Turns are 10 minutes of time. Troop replacements are generated by returning stragglers to the battle. A few special features are adjustable strengths, elite units, and Levels of Order (LoO). Units start with a certain amount of these LoO and as they lose them their abilities are reduced. Movement of each division level formation is randomized through a Leadership factor for each commander at that level. This game is a perfect introductory game for the Incredible Courage system. The level of fidelity and the level of playability have been mixed extremely well. Players will need to analyze many differing factors to apply the winning tactics to the battlefield. They will also be forced to consider contingencies since units will not always have the strength that they normally would. No gaming the combat system here by calculating the exact number of factors needed for a certain odds column. You will never know what the odds column will be until the combat is ready to be conducted. This battle will provide a challenge to both players. There is a short set of command rules that will knock your socks off! A Dispatch Rider system to send orders down to subordinate units (Corps to Division). And commanders don't always get the orders correctly, or they may be lost, or they may simply choose to ignore them. Another option is to have regimental ammunition shortgaes that can hit at the worst time, and they are more likely as the battle goes on. Game play is excellent for solitaire play and moves along very quickly. The randomized movement allows for very interactive action and you won't be sitting around waiting for the other player to finish. The price for this product is $75 plus shipping and handling. TX Residents 8.25% Tax. The game features adjustable strengths (that help decide firepower and melee strength based on formations). Turns are 10 minutes of time. A few special features are adjustable strengths, elite units, and Levels of Order (LoO). Units start with a certain amount of these LoO and as they lose them their abilities are reduced. Movement of each division level formation is randomized through a Leadership factor for each commander at that level. This game is a perfect introductory game for the Incredible Courage system. The level of fidelity and the level of playability have been mixed extremely well. Players will need to analyze many differing factors to apply the winning tactics to the battlefield. They will also be forced to consider contingencies since units will not always have the strength that they normally would. No gaming the combat system here by calculating the exact number of factors needed for a certain odds column. You will never know what the odds column will be until the combat is ready to be conducted. This battle will provide a challenge to both players. There is a short set of command rules that will knock your socks off! A Dispatch Rider system to send orders down to subordinate units (Corps to Division). And commanders don't always get the orders correctly, or they may be lost, or they may simply choose to ignore them. Imperial French Army sample units for IC 1809 - Alt-Eglofsheim. Unit counter fronts above and backs below. You can see the line formation on the front and column shown below. Artillery In Battery on the top and Out of Battery on the bottom. The price for this product is $85 plus shipping and handling. TX Residents 8.25% Tax. This battle deals with the situation at the start of the Battle for Ulm and the French cutting off of the Austrians. General Mahler of Marshall Ney's VI Corps is ordered to the south bank of the Danube. The general is faced by Austrians under the command of Baron D'Aspre who are positioned on the opposite bank of the Danube and are well supported. Mahler splits his force into three groups and attempts to take the three bridges in the area. His main force has no success in getting across the Danube in the center of his line, but they do capture the Baron and put his force into the dark with lesser leadership. Meanwhile, a bit further north, one French regiment manages to cross the Danube and proceeds to overwhelm a strong Austrin force guarding the crossing. Mahler then orders his remaining regiments to maneuver to the successful crossing site and together Mahler's divisions defeats the Austrians. The game features adjustable strengths (that help decide firepower and melee strength based on formations). Turns are 10 minutes of time. A few special features are adjustable strengths, elite units, and Levels of Order (LoO). Units start with a certain amount of these LoO and as they lose them their abilities are reduced. Movement of each division level formation is randomized through a Leadership factor for each commander at that level. This game is a good introductory game for the Incredible Courage system. The level of fidelity and the level of playability have been mixed extremely well. Players will need to analyze many differing factors to apply the winning tactics to the battlefield. They will also be forced to consider contingencies since units will not always have the strength that they normally would. No gaming the combat system here by calculating the exact number of factors needed for a certain odds column. You will never know what the odds column will be until the combat is ready to be conducted. This battle will provide a challenge to both players. Imperial French Army sample units for IC 1805 - Gunzburg. Unit counter fronts above and backs below. You can see the line formation on the front and column shown below. The price for this product is $99 plus shipping and handling. TX Residents 8.25% Tax. This battle is the First Contact of the Ulm campaign. It set the tone for the entire campaign and gave the French an immense boost of confidence. Napoleon has ordered his Advance Guard, consisting of part of Murat's Reserve Cavalry and Lannes' Vth Corps, to begin the swing around to the south and east of Ulm, in order to cut off Mack from Vienna. Mack, being a bit in the dark about the French maneuvers, sent a force under Baron Auffenberg, to determine where the French were. The Baron's force marched into a very bad situation where his troops, mostly grenadiers, was seriously outnumbered. A member of the French Impaerial Staff, General Kellerman, happened to be forward with the troops. He saw a small group of Austrians in the town of Hohenreichen and ordered the Dragoons he was with the dismount and clear out the Austrians. It was a small affair, but one that showcased the Dragoons ability to fight as infantry. The Dragoons success in pushing out the small Austrian force led to the scenarios that are included in the game. In the end the Austrian force was eliminated as a threat to Napoleons plan to surround and capture Mack's force. 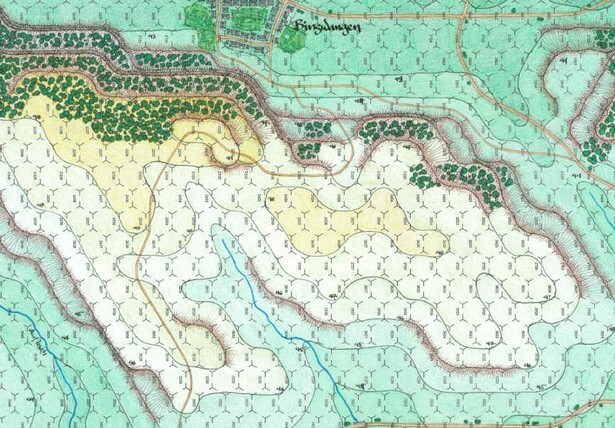 Map Sample showning the area of the main battle between the Austrian squares and the French cavalry. Sample units for IC 1805 - Wertingen. Austrians above and French below. (2) Scenarios that portray the Main Battle starting around noon, and the Austrian movement back to the main position. The price for this product is $105 plus shipping and handling. TX Residents 8.25% Tax. All these games focus on company and squadron maneuver and variable strengths. The time scale is 10 minutes per turn and each hex is 100 meters. Below is an excerpt from comments on Incredible Courage at Austerlitz by Ed Wimble posted on CSW. KAWANIA CHE KEETERU, Motto on the Schuylkill 32 pounder... "I am master wherever I am."